Your domain should be a source of income for you and there are two ways of achieving this. You can sell goods/services on your website or place adverts on it. If you want to make money with your website by selling goods or services on it, you must be able to accept credit card payments. This type of website is called an ecommerce website and you can set up your own merchant account with your bank in order to get the code that you will use to process credit card payments. This option is ideal for you if you are running a big business because it is a bit expensive. For a small business owner, you can use a third party payment gateway for credit card processing. This is a cheaper option as majority of payment gateway operators charge little (some are even free to set up) and have free order forms as well as free shopping carts for their customers. Some top online payment processors are PayPal, Volusion, 2Checkout, RegNow (for software authors), Kagi, CCBill and so on. Another advantage of using third party payment platforms, especially for small business owners, is that many consumers prefer giving their credit card information to these popular payment gateways than to just any website. 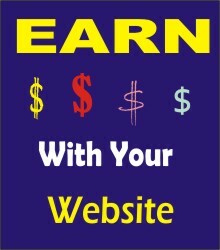 On the other hand, you can place adverts on your website and make money on a regular basis. You can look for sponsors and place their adverts on your domain or make use of a third party. There are third party companies that act as links between advertisers and publishers. Some popular ones are CommissionJunction, ClickBank, Bidvertiser, Clicksor, Google's AdSense, just to mention a few. There are 3 major types of advertisements that you can put on your website - pay-per-click (PPC), pay-per-thousand impression (PPM) and pay-per-action (PPA). Pay-per-click (PPC) Adverts : If you put these types of adverts on your domain, you will be paid anytime your visitors click on them. The amount you will be paid is determined by the keywords associated with your site and/or the third party company you are using. While some use bidding processes to determine cost-per-click (CPC) for advertisers, others have fixed rates. For example, Google's AdSense program makes use of a sophisticated bidding process to determine CPC for different keywords, hence, a keyword may cost more than another on its platform. The CPC will determine the amount that will be paid to you and it is usually a percentage of it. Pay-per-thousand impression (PPM) Adverts: With this type of advert, you are guaranteed payments for just running adverts on your web domain. It is calculated based on one thousand impression (M in Roman numerals) and that is why it is referred to as pay-per-thousand impression. The cost-per-thousand impression (CPM) to the advertiser is determined by the third party company you decide to deal with and this will determine your pay-per-thousand impression. Pay-per-action (PPA) Adverts: This is also referred to as affiliate marketing and carries the highest rate of commission compared to others mentioned above. PPA adverts reward you when visitors to your site take actions regarding the adverts. The action could be buying a product/service (pay-per-sale) or registering for a program/package (pay-per-lead). Another advantage of a PPA advert is that its revenue could be recurring. For example, if you are promoting a good or service that requires renewal, you may get a commission anytime a customer carries out a renewal. Commission from PPA adverts could either be a fixed percentage of the sale or a fixed amount and this will be indicated on the website of the third party company.